Jimmie B. Quinn, (Colonel, United States Army, Ret.) died on Tuesday, October 22, 2013. In 1965, he graduated from Henderson State University with a BS-BA degree and was commissioned in the United States Army as an Armor Second Lieutenant. He served two tours in Vietnam (to include command of M Company, 3rd Squadron, 11th ACR in 1968-69) and six years in Germany while commanding at every level to include Brigade. He earned a Master’s degree in business administration from the University of Arkansas, and served as a Tactical Officer and Instructor at the United States Military Academy at West Point. Jimmie also served as the aide-de-camp to the Commanding General as a Captain. He was a graduate of the United States Air Force Command and the General Staff College, Armed Forces Comptroller Course, and the United States Army War College. He retired from Fort Knox as a full Colonel, where he served as the Comptroller, Brigade Commander, and Chief of Staff after a total of 26 years of service. After retirement, Jimmie and "Cookie" moved to Murray, KY, where he became Director of the Occupational Safety and Health training Center at Murray State University. He also "worked" as a part-time fishing guide on Kentucky and Barkley Lakes. In 1995, Jimmie and Cookie returned to Pine Bluff to be near their families. He served as Director of the Workforce Development Center and Adult Education and as Dean of Finance and Administration for SEARK College for a number of years. Lieutenant Colonel (Ret.) Michael Gorton Healey passed away in the loving arms of his family at Sitter and Barfoot Veteran’s Care Center in Richmond, VA on Thursday, August 29th. Michael was born March 27, 1945, in Flint, Michigan. He attended the New Mexico Military Institute and was a graduate of the University of South Carolina, where he served as Vice President of the Sigma Phi Epsilon Fraternity and was awarded a Bachelor of Arts Degree. He subsequently earned a Master of Science Degree in Management from The Florida Institute of Technology. Michael was a career Army officer and decorated combat veteran. He served with distinction and valor with the 11th Armored Cavalry Regiment in the Republic of Viet Nam, where he received a Purple Heart, three Bronze Stars, and a Bronze Star with Valor. In 2009, his unit (Alpha Troop) was awarded the Presidential Unit Citation by President Barack Obama in delayed recognition of their conspicuous honor and valor. Further postings took him to Starkville, Mississippi; Orlando, Florida; West Germany (two tours); and a final assignment at Ft. Monroe Virginia, where he retired at the rank of Lieutenant Colonel after 23 years of service. He was a talented, multisport athlete who went to college on a swimming scholarship, loved basketball and skiing, and continued to run races into his fifties. He loved boating and traveling, and had a special compassion for animals. Most of all, he loved his family, and was loved just as much in return. His warmth and humor will be missed by family and friends alike. Surviving him are his loving and devoted wife of 31 years, Patricia Healey. In lieu of flowers, memorial donations may be made to the Sitter and Barfoot Veteran’s Care Center in Richmond, VA, whose staff cared for Michael with dedication and compassion during the past 5 years, or to the Wounded Warrior Project (woundedwarriorproject.org). Specialist Stafford is a 35M Human Intelligence (HUMINT) Collector. He attended the University of Texas at Arlington where he earned a Bachelor’s degree in Police Science and Sociology and was honored as a two-time All-American in Track and Field. He completed Basic Combat Training at Fort Leonard Wood, MO, and Advanced Individual Training at Fort Huachuca, AZ, graduating in the top five Soldiers in his class. Fort Irwin is his first duty station and he is assigned to the Vanguard Military Intelligence Company, Regimental Support Squadron. He is the Team Leader for the HUMINT Collection Team. During training rotations, SPC Stafford operates undercover to gain actionable intelligence in support of the Regimental Commander’s Priority Intelligence Requirements. He is also responsible for conducting classes on Tactical Questioning for Vanguard MICO and TICO Soldiers. SPC Stafford has earned the Army Achievement Medal, two Certificates of Achievement, and the Order of Hamby, Third Class for his excellence in Human Intelligence Collection. He graduated the Warrior Leader’s Course on the Commandant’s List in July 2013. SPC Stafford’s short-term goals include promotion to Sergeant, starting his Master’s Degree, and representing the Regimental Support Squadron and 11th ACR at the Fort Irwin/National Training Center Soldier of the Year competition. SPC Stafford’s long-term goals are to make the Army a career, earn the rank of Command Sergeant Major, finish his Master’s Degree, and complete a PhD. He is married to Taryn Stafford and has a step-son, Tayler Knutsen. SGT Anthony Lancaster spent three years and ten months in the Arkansas Army National Guard. He transitioned into the Active Component of the Army on December 1, 2009. Prior to enlisting in the active component, he attended Basic Combat Training and Advanced Individual Training at Fort Jackson, South Carolina. In Basic Combat Training, he received a Certificate of Achievement for obtaining a maximum score of three hundred on his Army Physical Fitness Test and was the Combatives Champion in Advanced Individual Training for his class. His first active duty station was Fort Riley, Kansas. The first position that he held was as a Paralegal Specialist in the 1st Infantry Division Criminal Law section and later was a battalion paralegal for the 84th Ordnance Battalion (EOD). He was selected to be a member of his battalion commander’s personnel security detail (PSD) due to his familiarization with convoy security from his time in the National Guard. His civilian education includes thirty-three credit hours acquired through Park University in the pursuit of an Associate’s Degree in Criminal Justice. He has been awarded the Army Achievement Medal (2 OLC), Army Commendation Medal, Army Good Conduct Medal, Army Reserve Commendation Achievement Medal, National Defense Service Medal, Iraq Campaign Medal, Global War On Terrorism Service Medal, Armed Forces Reserve Medal with the "M" device, Non Commissioned Officer Professional Development Ribbon, and the Army Service Ribbon. SGT Lancaster intends to further his education by pursuing his Associates degree in Criminal Justice. He wants to become the Fort Irwin NCO of the Year. He also intends to actively work to better himself and his career through military education and promotion to Sergeant Major. SGT Lancaster has also set goals to win this board and all those that may follow. He wants to be the Army Noncommissioned Officer of the Year and will be relentless in his pursuit. He is married to Liane Marie, and they have three sons: Jacob, Brayden, and Alexander. The original article in the eblast was correct. John Bailey did join the Regiment in Kaiserslautern. Here’s how that happened. John was serving in 1st Sqdn, 3d ACR in Baumholder in 1964. 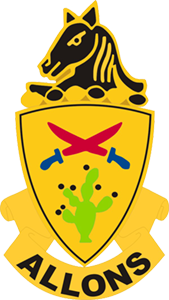 When the 11th ACR was redeployed that year from Germany to Fort Meade, the regiments swapped squadrons, transferring all the officers, NCOs, and troopers in the 3d who were near DEROS first to the 2d Sqdn, 3d ACR in Kaiserslautern, then redesignating that squadron as 1st Sqdn, 11th ACR. That squadron then redeployed as part of the Blackhorse. All the Blackhorse soldiers who had significant time remaining to serve in Germany were sent to K-Town as members of the newly formed 2d Squadron of the Brave Rifles. John was a gallant officer who went on to serve with distinction in the Regiment. It was my good fortune to have been his roommate in Baumholder in the summer of 1962, when I was a Cadet at West Point, serving on Army Orientation Training for a month with the Brave Rifles. Though married with a family, John, like all other members of the 3d ACR, was initially on an unaccompanied tour, living in the BOQ. In 1962, America was still on the gold standard, and our country had begun to experience an increasing outflow of gold as a trade deficit with Germany developed. Thus, when the Brave Rifles were deployed from Fort Meade to Germany in the early 1960s in response to Soviet provocations, dependents were not authorized to accompany, the belief being that all those family members would spend too much money on the economy, worsening the situation. This policy was changed by 1964, when I rejoined the 3d ACR in Kaiserslautern after graduation and commissioning in June 1963; I got to meet John’s family. I am sending this to you to let you know about a new book about the battle at Fire Base Illingworth. The book was written by Philip Keith, the same author that wrote "Blackhorse Riders". Although D Company played a very small role in the battle itself, we are mentioned several times in the book. Our arrival at Illingworth had two very real impacts. First, Col Nguyen Tuong Lia (commander of the NVA 272 Regiment) stated that when he heard the rumble of the tanks in the trees not far away, he knew he had failed and could not accomplish his mission. Second, we provided a great feeling of emancipation for all of the survivors and let them know that other Americans had risked their lives to come to their aid, even if we arrived a little late. As a member of D Company, you know that most of the feats we accomplished during our tour and in several other battles were more extensive than at Fire Base Illingworth. However, you can be proud of the part you played and the valor you exhibited. The letter below was sent in response to inquiries about the status of the 11th ACR Museum at Fort Irwin. The inquiry was made by LTC Scott M. McFarland, Commander, RSS, 11th ACR. 1. We are sending some of the collection to the Museum Support Center-Anniston. Basically, the items which are being shipped are those items which are not on display, but are in the storage area of the museum. And no, CMH is not closing the museum, nor are we removing anything which is currently on display in the museum galleries. What we are doing is moving the collection which is not on display to our dedicated curatorial storage facility where it will remain as a distinct collection housed in appropriate museum quality storage containers (not just dumped into crates) to be available as we renovate the museum, or as exhibits change over time. All the items which are catalogued as the 11ACR collection will continue to be catalogued as such. After the move you should see no difference to the museum as it is used for soldier training, VIP tours or Unit functions. What we are in essence doing is reducing the burden of curatorial duties (inventory, condition assessment, storage re-hosing) and associated costs in manpower and supplies for the museum staff. This would be the same even if we still had a civilian curator on duty there. 2. The 11th ACR museum transferred to CMH control in January 2007, along with all the other former FORSCOM museums (10MTN, 82 ABN, 101ABN etc.) pursuant to a MOA between the CG FORSCOM and CMH in 2006. As such CMH is responsible for personnel and budget, and we POM for the museums. The Army Museum re-organization and rationalization is aimed at looking across the Army Museum System and trying to save costs, reduce redundancies and right-size the collection which encompasses all 62 museums in the system. These are the Former FORSCOM museums, TRADOC Museums, IMCOM museums, and the "others" MEDDCOM, USASOC, AMC and several others. While these other MACOMs own the personnel, all the artifacts are owned by CMH and hand receipted to the various museums. Part of this plan is aimed at locating items which may have been at one museum by happenstance and moving them to the appropriate museum (an example would be if a veteran donated his WW2 paratrooper uniform to the Army Women’s Museum, when it should be at the 82nd museum). Another aspect would be to reduce costs of collections by de-accessioning unnecessary or duplicate items with no provenance to an individual or unit. A prime example of this is the over 1200 post-1950 M1 steel helmets which we currently have in the system. These are ones with no distinguishing marks, not ties to any known individual etc. They cost us money and space to store, and manpower hours to inventory. This is a problem endemic to the system. Now to the 11th ACR museum improvement. Our first efforts in this plan are the museums which we directly control. The way we are approaching this is by renovation and updating of the exhibit galleries. We cannot re-do the physical structures as you know since they are not ours, but belong to IMCOM. The process begins when our exhibit designers meet with the museum curator (in this case with MSG Agmata) to get an understanding of the current exhibit galleries and the storyline. Then they will work with the Chief of our Programs Branch, Dr. Jim Kelly, to develop a storyline which tells the story of the unit and how that can be translated into meaningful displays. This process involves historical research and will identify iconic items or events which will then be included in the plan. Based on this collaboration the designer will come up with a design for the gallery space, similar to an architect’s rendering of a new building. In our case this includes information on display cases, graphics and text panels. When everyone agrees on a final version, CMH will then write a contract for an exhibit company to fabricate and install the exhibits. If this requires modification to the building (moving non-bearing walls, adding electrical outlets etc.) that would have to be coordinated with the local DPW. CMH has POMed for the renovation of the museums across the 15-19 POM. I believe that Fort Irwin was POMed for FY15. Of course, given the current fiscal condition the Army is in, we are not sure how the actual budget request will shake out. Planning will go ahead so we will be ready pending availability of funds. As we get plans, they will be shared with the regiment. Our hope is that if we get relief from the hiring freeze we can hire the Museum Director position, and they will be a constant to share iterations of planning with the Regiment during the process. For now that will have to be MSG Agmata and his replacement after he has ETSd. Of course, I am always available during this process as well since the former FORSCOM museums come under my purview. 3. In the re-design of the museum galleries, the museum will become what we are referring to a "Gallery Only Museum". It is a rather cumbersome term, but what it means is that instead of creating storage space for non-displayed items, we will use that space to expand the galleries to tell more of the regimental history and that of the NTC as well. Those items not selected for display will continue to be housed at the Museum Support Center-Anniston, and will be available to be recalled to the museum as needed to rotate on display for other artifacts which will then go back to curatorial storage at Anniston as part of the 11th ACR collection. This will allow us to keep costs lower by having centralized storage with a dedicated curatorial staff whose sole mission is inventory and care of these collections. This also allows the onsite museum curator to spend more time dedicated to outreach and education missions at the museum. But, since we are not removing the current galleries those items won’t be going away any time soon. Once we do have funds and begin the renovation, the museum will need to be closed for some period of time to do work. At that time there will be a plan to relocate artifacts which are going off display and as exhibits are installed the new artifacts or old ones which are re-exhibited will be installed. I would hazard a guess that the museum might actually be closed to the public for one month while everything is removed, prepped, and re-installed. This is just a guess, and usually installation only takes a week. But just to give you an estimate. Please rest assured that we are planning to work in collaboration with the Regiment to develop and create an outstanding new museum. I am happy to stay in contact with you throughout this process, and ensure that the Regiment and the garrison are kept aware of things as we move forward. At this stage, by moving the non-displayed items out we are starting on phase one concurrently with the designing phase. During our visit and inventory, we found several extraordinary artifacts which will undergo conservation review and preparation so they can be incorporated in the new museum. We will also expand the coverage of current operations in the new plan. 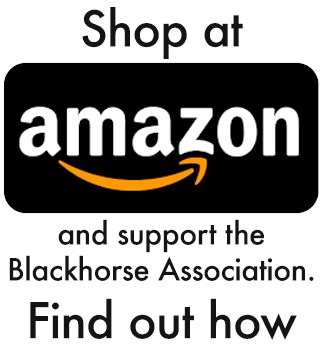 The 11th Armored Cavalry Regiment’s Blackhorse Association will hold its annual Blackhorse Family reunion in Colorado Springs, CO, June 12 -15, 2014. The reunion is open to all past and present troopers who served with the Regiment, the Regimental Community, and all separate units that supported the Regiment. The reunion will be held at the Hotel Elegante Conference and Event Center, 2886 South Circle Drive, Colorado Springs, CO, 80908. The Elegante is in the process of a major several million dollar renovation. Rooms have been set aside for reunion attendees at a special negotiated rate of $115 per night. Attendees are encouraged to make plans early. For reservations, please visit https://www.reseze.net/cassets/mkt/mcmelegante/landing_pages/MCM_Colorado_Blackhorse_Association.htmlopens in a new window or call (800) 981-4012 (reservations). You can phone their Front Desk directly at (719) 576-5900 (be sure to give them our Group ID number – 693108 – and say you are attending the Blackhorse reunion). For additional lodging options, go to http://www.expedia.com/Colorado-Springs-Hotels.d602991.Travel-Guide-Hotelsopens in a new window. If you have an item of interest to the membership that you would like to see in future eBlasts or our bi-annual newsletter, please send items directly to banditsix@aol.comopens in a new window. The more detail you provide the better. In particular if you have knowledge of the passing of a former member of the Regiment and want this information published, please provide details of Regimental service and/or an obituary. This is your newsletter, please contribute.